Track cleaning is one of those jobs that has to be carried out on a regular basis if you want to have your trains run well. This is especially important in the smaller scales. You can get away with less cleaning on large G scale layouts, but even there good electrical pick up is vital unless you are using battery power. I've found that good electrical pick up on DCC layouts is even more important than on DC track. Silent and sound decoders are susceptible to a small amount of dirt on the rails. While preparing for an operating session to show fellow members of our Nottawasage Model Railroad Club how to use car cards, I got to thinking that some of you might be unaware of methods that have been tried over the years. Everyone seems to have a favorite method. There are several major reasons for poor electrical pickup. One is dirt and crud that is picked up by wheels and spread around the layout. The other is oxidation of the rail head. This is assuming that you've already cleaned any glue or paint off the railheads when you installed the trackwork. Many modelers feel that plastic wheels pick up dirt faster than metal wheels. I believe this is true. I try to replace plastic wheel sets with metal wheels when I build or acquire a piece of rolling stock. This also has the added benefit of lowering the center of gravity of the car and adding a little more weight. This helps tracking over uneven track (not that any of us have bad track!). I also use a metal brush in a Dremel to spin-clean the wheels whenever a "bad order" car comes to the workbench for maintenance. Sometimes one needs to use the back edge of an X-Acto knife to scrape off the built-up caked crud. If the wheels aren't clean the dirt gets spread around the layout after you've gone to the trouble of track cleaning. Brass rail is more troublesome than nickel silver rail. Steel rail is a brute, but it is seldom used anymore. I've also been cautioned that chemically pre-blackened, weathered rail can be a problem. I still prefer to use a Bright Boy eraser for general track cleaning. Some modelers feel the abrasive blocks from Walthers or Peco leave tiny scratches in the rail head that attract dirt. Maybe so, but the dirt is going to find a way to get there anyway. The long-handled tool with the eraser in the photo I bought from Micro Mark. It's great for cleaning in tunnels, bridges and other out-of-the-way spots. I also like Aero fluid. I use it on a piece of J-cloth stretched across the track and then I run my DCC engines over it letting the wheels spin. You need to be careful to avoid getting the Aero fluid all over the locomotive while holding it, not that it will do any really damage if you do. I use this method before every operating session for all locomotives that will be running. Non-petroleum-based Labelle 101 lubricant is also a recommended choice. A few drops on the rails is all that's needed. Wipe the rail head and let the trains spread it around. I saw this tip in the NMRA magazine, Scale Rails, August 2009. In that same issue on page 11 there was a description and photo of a wheel-cleaning track where the author, Don Jennings, had made circular saw cuts beside the track on a board and inserted a paper towel through the slots. This is a clever idea because it solves the problem of pulling the J-cloth or paper towel underneath the locomotive's wheels. It would allow holding the towel taut so the couplers don't snag as you move the engine across the cleaning pad. The other way I use Aero fluid is on a piece of J-cloth wrapped around the metal roller in an Aztek track cleaning car. I put the Aztek track cleaning car in a work train and make it part of an operating session. In the photo, a caboose-type car with a tank for track cleaning fluid is on the rear of the train. This type of car works by allowing the fluid to soak a pad underneath the car. There are several on the market. I find this method too messy. At least, I've never had much success with it. There are also abrasive pads that can be inserted into the floor of a boxcar and pulled around the layout. These usually use very fine sandpaper. I have one of these mounted in a Great Northern boxcar, but found it has a tendency to snag on turnouts. Probably because I mounted it slightly off center. Cars like this help to keep the track clean in tunnels or other places that are difficult to reach. Roundhouse made a box cab locomotive with rotating abrasive pads to polish the rails. I don't know if this is still available. Mine has a gearing problem that I've never been able to fix properly so the engine is on the "get around to it one day" shelf. Some modellers use citrus-based products like Goo-B-Gone or De-Solv-It. We used to use this at the NMRC club. I find it leaves a residue on the rails so no longer use it. Others swear by hair clipper oil. This leaves a thin layer of oil on the rails to stop oxidation. I still have a bottle. I'm not sure if it is a good idea. I also found that methods like this interfere with the number of cars that can be pulled up a grade. Unless you like wheel slip or want to double- and triple-head those DCC locomotives of yours. Another method I've used for DC is the Kadee wire brush that you clip to the rails and spin the engine's wheels against. Because the wires are prone to causing short circuits as you spin the wheels, I don't use this for DCC locomotives. Another method for DC layouts is to put a high frequency pulse on the rails to break up the dirt. I used to have one of these connected before I went to DCC. I assume the signal would interfere with the DCC signal so I never tried it. Then, of course, you can just give up getting rid of the dirt and crud and take a "work around" approach. Large G scale locomotives often work better because they have shoes that slide along the rails, and they are much heavier to begin with. Lionel trains also used shoes. Taurus Products makes track sliders that you can attach to HO scale locomotives. This takes a little work and ingenuity. Many of the older locomotives were made with "white metal" that is difficult to drill and tap for the screws you need to insert. I've got an old DC Varney Dockside 0-4-0 that uses these sliders. And then there's No-Ox. Works so well the product was discontinued because modellers only had to buy it once in a lifetime. I have a can of it. Fellow modeller, John Houghton, has used it with great success on his N scale layout. This is a paste that's supposed to protect your track from oxidation for a very long time. I'm trying it. We'll see how it works. 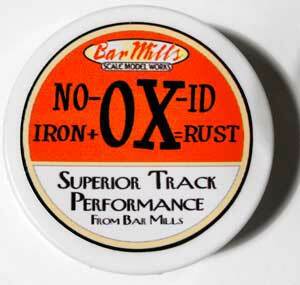 See my review of No-Ox if you're interested in more information. One of my operators who is a member of our local club has an N-scale layout at home. He borrowed my can of No-Ox to try and reports excellent results. He has not had to clean his track for 6 months. I plan to try it again on the new UNRR after I get the track work finished. I was reminded of another method that I haven't tried yet: Flitz metal polish. This provides a barrier to stop the oxidation. At the Woodstock Turn NMRA convention I heard about using a carbon stick from an art store to do something similar. I received an email from a visitor to my site who said "I also have been trying to find a track cleaner that works. 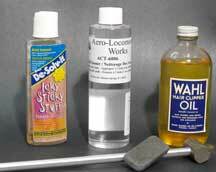 I was cleaning my track and thought about WD-40. This product works on many things, why not track. So I tried it and it works great and does not leavea slippery film. Just put some on a non lint rag and presto, work like a charm. Remember, do not overdo it with the application." Track cleaning is one of those subjects that is as old and varied as model railroading itself. There is no best way, otherwise we wouldn't still be discussing it. I hope I've given you a few tips and techniques to try for yourself. If you find another method that works better, please let me know so I can add it here. I received an email from Bob Wehner who visited my site. He reminded me of a simple, inexpensive method of cleaning track. "Bob wrote "If you cut a piece of peg board and bevel the ends so it doesn't hang up on uneven spots that might appear out of nowhere, then drill 2 holes in it and insert a finishing nail that you have dipped in E6000 glue. If you clamp the peg board to the floor of a boxcar after taking the box car off and then drill your holes they will be in line. After drilling the 2 holes in the floor of a boxcar or flatcar, pull it in the train after you have cleaned with Goo Gone. It will finish cleaning up the Goo Gone and your tracks". This is similar to the abrasive pad method mentioned above. You can also use a piece of masonite the width of the track. This works in HO scale. I don't know if it will work in N or smaller scales. At our NMRC train club one night recently we were discussing track-cleaning and it was suggested that a few drops of automotive transmission fluid worked well to keep rails conductive. One of our members thought this chemical was a primary component in RailZip. I've used the latter to good effect. A product I've seen advertised is NeverStall. I haven't had an opportunity to try it yet. Let me know if you have experience with it. Go from "track-cleaning" to my Tool Tips page. Return from "track-cleaning" to my Home Page.